A sickly yellowish light tints the walls of St. Stanislaus Kostka Auditorium on Newell Street, Brooklyn. Several attractive young women instruct incomers to sign their names on a legal pad. Eventually, the room fills with people of all ages, dragging on this Monday evening but still curious, having received a pink flyer printed in Polish on one side and English on the other. The flyer’s headline: Your property may be contaminated and your health threatened due to a massive oil spill in Greenpoint. As the crowd settles in, three men make their way onto the stage. One of them, suit-clad, steps forward to address the crowd. After the presentation, a middle-aged woman, shrouded in a head scarf, approaches the speaker. Her eyes are heavy with despair. A Polish translator explains that the woman suffers from lung cancer. She never smoked. He is Marc Bern, an attorney from Napoli, Bern, and Ripka, and he’s recruiting Greenpoint residents to join a suit against Exxon Mobil. It’s one of two large lawsuits—in 2005, Giardi and Keese, a California-based environmental firm, also filed a suit against Exxon Mobil, as well as British Petroleum and Chevron (the firm dismissed Chevron from the suit in 2006)—alleging that the oil poses a direct danger both to the lives of citizens and the value of their homes. One worry about living on the plume is that vapors associated with it might be wending their way into people’s homes. The talk in the community is that “you can get deadly sick from the fumes,” says Francis Flynn, 56, a life-time resident of Hausman Street, portions of which are above the plume. So far, no study has been conducted to see if there’s a link between residents’ health problems and their homes’ proximity to the spill, although some community members are clamoring for an investigation. 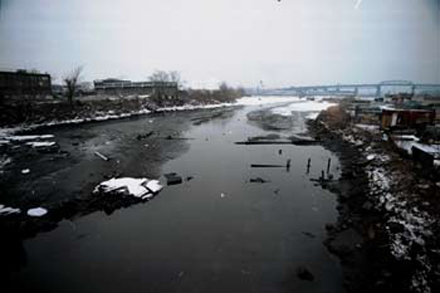 The state Department of Health “would like us to believe that the cancer cases are no different here than anywhere else” says Laura Hoffman, a member of the Newtown Creek Alliance. “Of course, we find that hard to believe,” she says. Vapors rising up from underground oil spills can enter a home through cracks in basements, crawl spaces, or concrete slabs—and anyone inside can be exposed to them just by breathing the indoor air. Some of the compounds often found in petroleum vapors have been linked to health problems. One such compound is benzene, which is classified as a known carcinogen by the federal government. Long-term exposure to benzene has been linked to leukemia. This summer, a contractor for Exxon Mobil conducted a soil vapor study in Greenpoint. It took ten samples from a residential area; of five samples that detected benzene, one was from an area above the oil plume at a level below 5.4 parts per billion. The EPA estimates that breathing just 0.4 parts per billion of benzene in air over a lifetime could cause a risk of one additional cancer case for every 100,000 people exposed. In a September draft report on the study, the Exxon contractor, Roux Associates, contended that intrusion from vapors was not likely to be a problem for people living on top of the plume. It said that vapors should naturally degrade as they pass through a basement slab. By the time they reach the inside of the house, contaminant levels should be at levels typical of regular indoor air, which for benzene can sometimes range from 1.1 to 6.6 parts per billion, according to an EPA database on indoor air values cited in the Roux report. So far, the state has not received any complaints about strange vapors in residents’ homes. But whether or not Roux’s conclusion is actually true remains to be seen. “We always take [Exxon’s recommendations] with a grain of salt,” says Hale. And the only way to be sure that Greenpoint citizens living on or near the plume aren’t being affected by oil-associated vapors is to take soil vapor samples from inside homes; the state is currently carrying out such a study. If it finds those vapors, the steps to control them are fairly simple. An off-the-shelf radon system—which works by intercepting vapors before they enter a house and venting them into the air outside—could do the trick. Some people, however, are wary of subjecting their homes to tests in the first place. They’re worried that if vapors are discovered, their property values might go down. Still others are reluctant to participate because they’re part of a lawsuit and are waiting until they get the green light from their lawyers. But even if vapors turn out not to be an issue in the homes, the smell of oil is still a problem on the creek, where it emanates from oily sheens on the surface.